It is highly likely that the stressful lifestyle of living in Singapore is one of the main factors that brought about the increase of Pet ownership amongst Singaporeans. After all, having a pet in our lives have proven to be nothing short of therapeutic and rewarding at the same time. 1 out of 3 people within your circle of friends or family probably are Pet owners! Insurance can be a rather tricky and troublesome thing to figure out, but in a way it is a definite must for every human being, ensuring you receive monetary help in times of need. 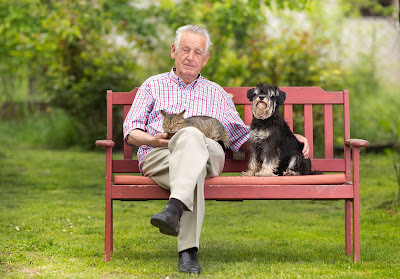 By now, Pet owners are no strangers to how costly a medical procedure can be, and like humans, pets can also contract illnesses and such as they grow older. This is why Pet Insurance has come about, all to help you tackle the unexpected accidents and monetary issues that might surface. 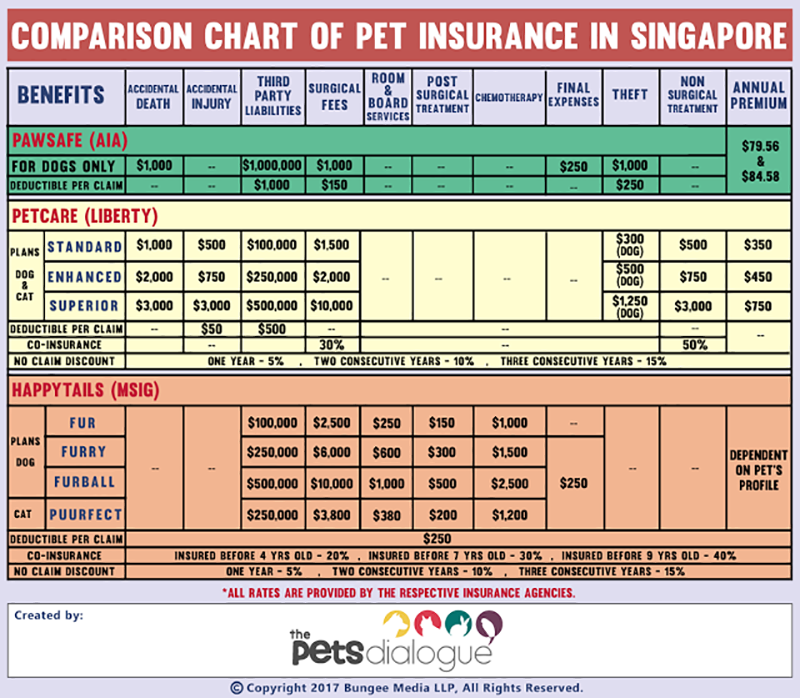 As concerned pet owners ourselves, we took the liberty of looking through every insurance policy available for pets in Singapore, and compiled the important information (including a chart!) that you can now browse through and decide on the best plan to consider for your Furkids! To begin, there are THREE Insurance companies that cover policies for your pets. 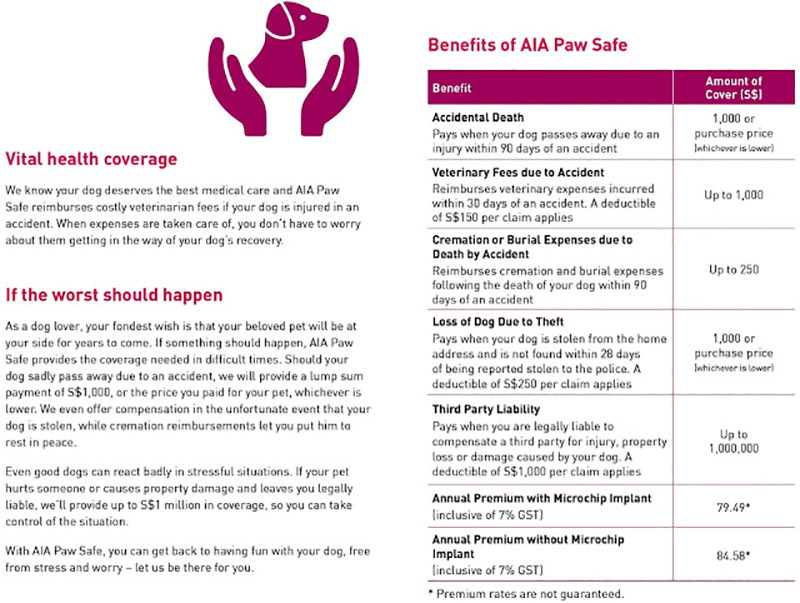 These are PawSafe (by AIA Insurance), PetCare (by Liberty Insurance) and HappyTails (by MSIG Insurance). 1. All breeds accepted except - Mastiff, Bull Terrier, Staffordshire Bull Terrier, Pitbull Terrier, American Pitbull Terrier, Argentina Dog, Canary Dog, American Bulldog and Dogs that are crossbred with the listed breeds and/or wolves. Some of the main exclusions in this policy includes: Pre-existing conditions, Congenital/Hereditary defects and diseases, Breeding related conditions, Skin problems, Pregnancy and Castration related issues. Remember to review the full list of Exclusions in the policy when presented to you in print. PawSafe has a “Free Look” period of 14 days, which means if you wish to cancel the policy, it has to be done within 14 days from commencement, with no claims made. PetCare is an insurance policy by Liberty Insurance since February 2014, this policy has 3 plans that covers both Dogs AND Cats. The 3 plans are: Standard, Enhanced and Superior. 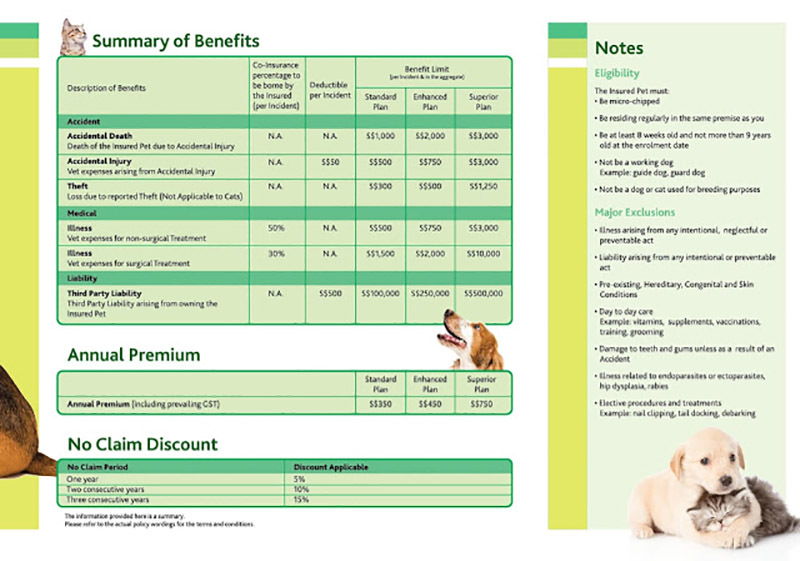 The image below was taken from the PetCare brochure itself, it shows the main benefits and coverage limit for cases pertaining to each claim. PetCare covers both non-surgical AND surgical procedures. Major Exclusions are a few things that this policy does not cover, as always, be sure to go through the entire list of exclusion when they give you a printed copy of the policy! As you can see, the amount of Deductibles are much lesser for this policy, and under “Annual Premiums” is the amount in SGD you are required to pay yearly, inclusive of GST. Naturally, the higher your premium, the higher the coverage limit. This refers to an entitled discount percentage on the payable premiums if you have not made any claims under the policy after 1 year and above. PetCare policy has a “Free Look” period of 14 days too, similarly, if no claims are made within 14 days from commencement of policy, you may cancel it if you wish to. The main coverage of HappyTails policy includes the following, with different annual coverage limits according to different plans. For Happy Tails, an amount of SGD $250 per claim is mandatory, payable by you per claim, applies for all plans. 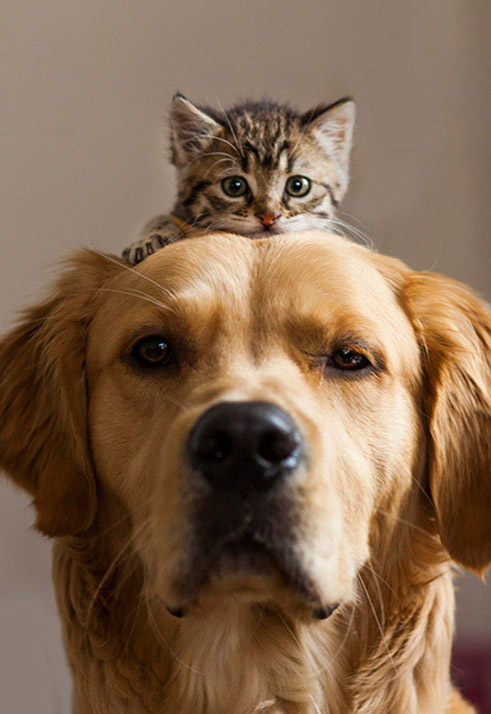 Co-insurance rates apply for a lifetime, which is why Pet owners are encouraged to register their pets at a younger age, to enjoy the rates. This rate will be your payable share of the made claim for both Dogs AND Cats, excluding Deductible. For example, if your Pet’s age group falls in the 20% category upon applying, this percentage applies for a lifetime and does not change, even as your pet ages. HappyTails policies do not cover pre-existing conditions, clinical examination for insurance enrolment, preventative care such as annual check-ups, vaccinations; spay/neuter procedures and teeth cleaning. Be sure to take note on the full list of exclusions when they present the policy to you! Based on their listed coverage, they are really more on helping out with the costs incurred for necessary surgeries and post-surgical treatments due to unforeseen accidents, which can surmount to enormous sums. The premium rates of HappyTails insurance policies may vary according to Pet’s age, and conditions. You may get a quick quotation from them by answering a few questions on these forms, they end off with an estimated rate for all plans! Otherwise, you can always drop them a call at 6221 8222 for a fast quote as well. The friendly staff are more than willing to help with no obligations! HappyTails policy has a “Free Look” period of 14 days too, similarly, if no claims are made within 14 days from commencement of policy, you may cancel it if you wish to. Still Unsure Which To Get? There is no doubt that things can get rather confusing when it comes to Insurance for us humans, and it is exactly the same way for our Furkids. That is why we did up a comparison chart, on all three different agencies, with all their plans and how each differs from the other in terms of coverage. The listed benefits, information, and rates were compiled by us. This chart is meant to show you clearly what some policies may or may not offer. However, if you do eventually consider on one or two different policies, it is extremely important to go through the print contract carefully, to get the nitty-gritty of exclusions and coverage. Frankly, there isn't an all-rounder plan out there, but you could get 2 policies of different insurance agencies if need be. Ultimately the determining factor should be what us Pawrents are more concerned about. For example, Pawrents in our team are definitely worried about complications that may arise as our pets age, so coverage benefits for Surgical bills and Post Surgery Treatment is an absolute definite! Apart from that, coverage for Accidental Injury comes in handy too, so eventually we all settled for 2 different policies per Dog. They are family, and they deserve the same concern and protection. It's a pity there isn't any insurance for Rabbits, Guinea Pigs and other small animals don't you think? Have YOU gotten any of these policies? Share your thoughts with us! Your voices are important to us and the Pets community, our readers are encouraged to share their Pet-related reviews of a place and its services, experiences, even lifestyle tips and tricks to better our Pets lives, on our platform, one paw at a time. Be a part of an educational and informative Pets community because at ThePetsDialogue, your voices could make a huge difference on a global scale.